Occult rockers conjure up devilishly fine third album. It would be a great shame if one were to look at Ghost, with their metallic masks and tailored uniforms, their Nameless Ghouls and succession of skeletal ‘Evil Pope’ front things, and dismiss the Swedes as a mere gimmick, a joke. For beneath the lurid, macabre showmanship and spectacle, there beats the heart of a truly accomplished rock band. 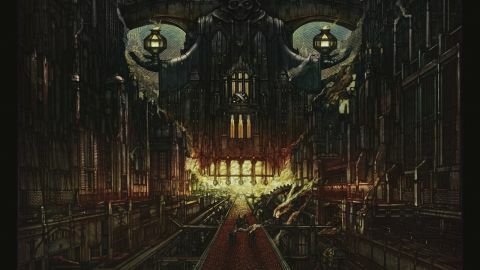 With its Latin title roughly translating as ‘a yearning to be better’, Meliora is easily the sextet’s finest outing to date, a meticulously executed, artful collection of black-souled retro doom-pop, as heavy as Metallica, as melodically sophisticated as ABBA. Exhibit A for the defence is He Is, a chillingly beautiful hymn of praise to The One With Horns, which with its chiming acoustic guitars, stacked choral vocals and tinkling piano arpeggios, could be the Beach Boys if Brian Wilson had grown up on Scandinavian black metal. Elsewhere, Cirice boasts a killer Slayer-indebted central riff and captivating ‘I can see through the scars inside you’ chorus, Devil Church is an archly atmospheric instrumental, and the thudding Majesty is prettier and more uplifting than any song discussing ‘rotting carcasses’ and ‘soulless sheep’ has a right to be. This cult is only going to grow.